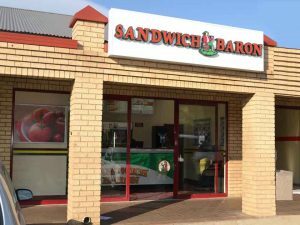 HAVING BEGUN operating from 1996 from humble beginnings the popular Sandwich Baron has grown to over 46 stores country-wide in franchises but the first franchise opened in Germiston 1997. The new Baron Sandwich franchise has opened in Hougton, Isle of Houghton-Johannesburg. Started by the omnipotent Sally J’Arlette-Joy, who introduced handful media to her latest franchise in Houghton (Isle of Houghton) recently, by affording them to a tasting session, Sally spoke on the beginnings of the company and how she still keeps the wheel grinding after years in the food and hospitality industry that’s forever evolving. The venue is ideal as it encompasses work and residential buildings. Sandwich Baron is literally the best thing since sliced bread and is a growing South African concern with fantastic wealth creation potential for any individual, in terms of owning your own franchise. The platters start from R50 upwards. 5 of the Sandwich Barons are company owned. Delivering Banting Food Sandwich– shall await the Soweto franchise soon, isn’t Sally?